In the last week of June 1918, the “Countess of Kingston” visited Pittsburgh to debut a traveling exhibit of war items intended to raise money for the Shamrock Fund, a charity for wounded Irish soldiers. The collection included “German Uniforms, Helmets, Military Equipment, Hand Grenades, Propaganda Literature, Iron Cross, Lusitania medal, British Battleship Vindictive Souvenir, German Prison Bread, and a Wonderful Collection of British War Pictures,” according to newspaper promotions. Ethel Lisette King-Tenison, nee Walker was the daughter of the late Sir Andrew Harclay Walker, a brewer and former Lord Mayor of Liverpool. In 1897, she married Henry Edwyn King-Tenison, 9th Earl of Kingston, a captain in the Irish Guards. He was wounded in September 1914 at the Marne, the first major battle of the Great War, and recovered at their home, Kilronan Castle, in County Roscommon. When our soldiers began returning from the western front in France and from the barren waste of Gallipoli the horrors that we had shrinkingly read about were to be met face to face on our streets in Ireland. Men without eyesight, legless, armless men, wrecks of men it seemed for whom a miracle must be worked if they were ever to be restored to usefulness in this world. They might be restored, but it required money, and where was it to come from? We could not find it in Ireland, we could not burden England, already carrying an awful weight, and it was then I said: ‘I shall go to the United States, where there is plenty of money and plenty of Irishmen. Lady Kingston told the Times that about 800 men were being cared for by the Shamrock Fund, but the numbers were growing daily. 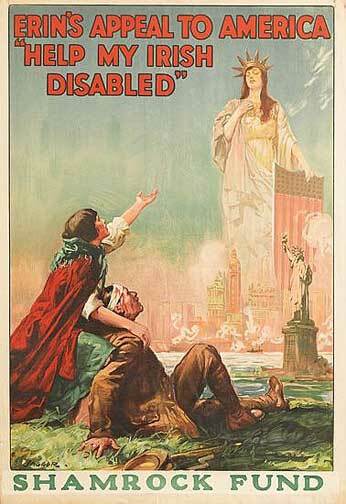 Men who lost limbs in the war received pensions sufficient for their support, but soldiers with lesser injuries received only $1.25 to $2.50 per week, she said, which was “inadequate” for their civilian survival. She was right about that. Some 200,000 Irishmen enlisted in the British military from 1914 to 1918. Upwards of 49,000 were killed, and tens of thousands more were injured, both physically and psychologically. As with all wars, casualty figures are highly imprecise. The Shamrock Fund opened an office at 39 E. 58th St., New York. later moved to 14 E. 60th St. In Ireland, the effort was coordinated through an office at 30 Molesworth St, Dublin. In October 1917, the fund was listed among dozens of other “war relief charities rendering satisfactory financial accountings,” according to the U.S.-based Charity Organization Society. From November 1916 until shortly after the November 1918 armistice, Lady Kingston crisscrossed the United States to enlist the financial and volunteer support of high society women and others in the cause helping disabled Irish soldiers. There were a few missteps along the way. Actor Charlie Chaplin failed to show for a New York concert, generating discontent among those who bought their tickets in advance. Some volunteers in Spokane, Washington state, were arrested for “aggressive fundraising” when they charged $4 for a sprig of shamrock. On the other side of the Atlantic, the Shamrock Fund also drew the attention of Parliament. In May 1918, Lieutenant-Colonel Robert McCalmont, an Antrim East M.P., raised questions about “the necessity for such an appeal to another country.” Sir Arthur Griffith-Boscawen, parliamentary secretary at the Ministry of Pensions, told members the Shamrock Fund had donated £5,000 to the government’s Soldiers’ and Sailors’ Help Society (Irish Branch), which was providing its own training and help for disabled soldiers to secure employment. The Irish War Exhibit was part of a new effort to raise $350,000. The Pittsburgh Daily Post reported that because of the assistance Lady Kingston received during her 1917 visit to the Pennsylvania city, then a major Irish immigrant hub, “and because of their interest, Pittsburgh was selected as the city in which the drive would be launched.” The display was free to the public 24-29 June, in the 11th floor auditorium of the Kaufmann’s department store. Someone donated a 200-year-old “Irish lace Limerick veil” for later auction, and at least $1,000 was raised in one day, according to newspaper reports. From Pittsburgh, the countess and the war exhibit traveled west to Elgin, Illinois, and Des Moines, Iowa, during July; Butte, Montana, and Salt Lake City, Utah, in August; Seattle, Washington, in October; and Portland, Oregon, in November, among other stops, also typically at department stores. The war was ended by the time Lady Kingston and her collection of war curios reached the O’Connor, Moffat & Co., store in San Francisco, California, in early December. I have been everywhere and everywhere found friends and support. … While these broken men live their claim on Irish men and women is sacred, coming before every other claim. We Irish women (she reportedly was born in Scotland) realize what we owe them, and all we can do is pay something on account by showing them how to take up life again. 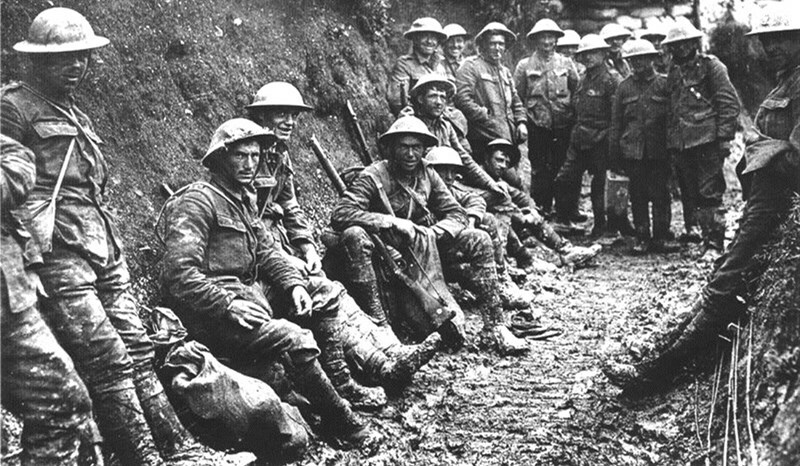 In the trenches of World War I. Lady Kingston quotes and Dublin office address, New York Herald, March 23, 1919, page 58. … The New York Times, Nov. 6, 1916, page 11; Nov. 12, 1916, page 40; and Oct. 7, 1917, page 27. … Occasional fundraising troubles, from Little Book of Bray and Enniskerry, by Brian White, The History Press of Ireland, Dublin, 2016. No page numbers in online edition. … Parliamentary attention in May 1918, links to Hansard, the Official Report. … Pittsburgh details from Pittsburgh Daily Post, June 23, 1918, page 16; Pittsburgh Press, June 29, 1918, page 2. … Irish War Exhibit itinerary based on other local newspaper coverage, viewed via Newspapers.com. This entry was posted in History, Irish America, Journalism and tagged County Roscommon, pittsburgh, Shamrock Fund, World War I on June 25, 2018 by admin.